Turning 18 is a huge milestone for young women, and for up-and-coming singer-songwriter Claudia Barretto, her debutante ball on Saturday, August 5, was nothing short of ~magical~. 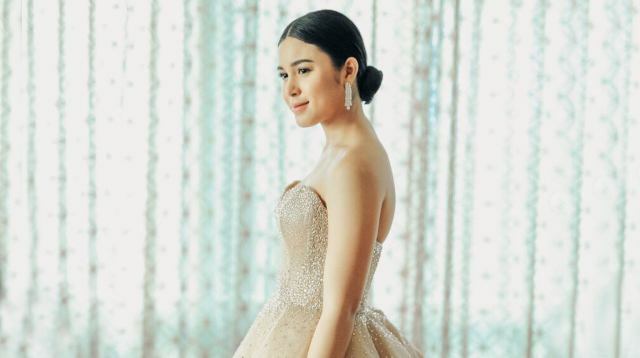 Claudia, whose actual birthday is on July 26, dazzled in a Mark Bumgarner Swarovski-studded champagne gown, with her hair pulled back in a sleek up-do. The same-day edit (SDE) video posted by Nice Print Photography showed highlights of her debut at Whitespace Manila in Makati, as well as touching birthday messages from Claudia's mom, Marjorie Barretto, and her sister, Julia. "The minute you were born, I said to myself, 'Oh my God, it's another girl?!'" Julia teased. "...But in a good way," she continued. "Of course, I was so glad that I was gonna have a little sister and that I had you growing up. Sometimes, parang ate ka pa and I appreciate that because I had someone to guide me and protect me from all the bad things in the world." "What more can a mom ask for?" Marjorie beamed. "She's almost perfect. She's beautiful, she's so intelligent, [and] hardworking. She's got her dreams, and as early as now, she has every intention of fulfilling every single dream of hers." Marjorie then raised her glass to the debutante (who can now legally drink, BTW). Towards the latter part of the evening, Claudia let her hair down and changed into a blue fringe dress from Atelier Patty Ang to party the night away with family and friends. Even the day after, Claudia was still in high spirits from her big night. "Last night was a dream," she tweeted.